The familiar 22° halo around the Sun or Moon occurs because of refraction in tiny hexagonal ice crystals in the air. With the 60° apex angle of the prism formed by extending the sides of the crystal and the index of refraction of ice (n=1.31) one can calculate the angle of minium deviation to be 21.84°. Further refinement using n=1.306 for red and n=1.317 for blue gives angles of 21.54° and 22.37° for red and blue respectively. The inner edge of the halo is sharp and appears reddened - the angle of minimum deviation for red is less and you see it from crystals closer to the Sun or Moon direction. The out edge of the halo is blue in appearance but less saturated because other wavelengths can refract at that angle. Calculation Can you have diffraction at this angle? Can you see a 22° halo from the equator? The familiar separation of the colors of white light in a prism is a result of dispersion, the variation of the index of refraction of light with wavelength. Since hexagonal ice crystals make up a section of a a 60° prism, they separate the colors of white light. This gives the rainbow hues of the parhelia. At the points on the 22° halo which are on a horizontal line with the sun, the arc commonly broadens to two bright spots, reputedly referred to by artic people as the sun's dogs. The refracted light at these points is so much more intense than the remainder of the 22° halo that they are often seen when the remainder of the arc is not. The parhelia often show rainbow colors from the dispersion in the ice crystals. 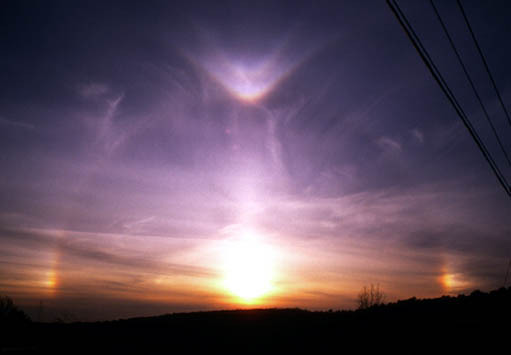 While appearing on the 22° halo when the sun is at the horizon, they appear to be slightly outside it at higher altitudes and will flare into a white tail leading away from the 22° halo. Under appropriate conditions the tail may extend far outward on the horizontal "parhelic circle". This extension of the sun dogs is reflection from the vertical sides of the flat hexagonal ice crystals. 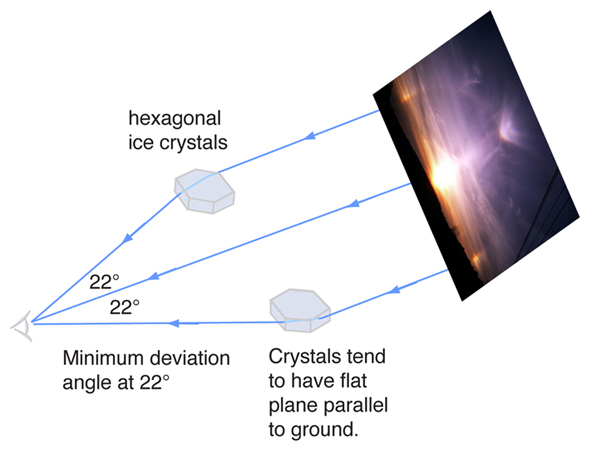 The accentuated light at the intersection of a horizontal line through the Sun's position is attributed to the preferential orientation of the hexagonal ice crystals. Ron Edge models the tendency toward this flat orientation of the crystals in terms of the Bernoulli effect.